With the New York Giants preparing to make arguably their most important draft choice in the past decade, speculation is surrounding the organization and fan-base. But, let’s take a break from the speculation and take a look at who is bound for a huge year in 2018. The Giants saw most of their players struggle last season for obvious reasons, and hopefully a majority of them will return with a vengeance. They will all likely improve from the lost 2017 season, but the one player that is bound for a huge year is defensive end Olivier Vernon. In 2017, Vernon suffered a high ankle sprain in week four, but continued to play throughout the year despite the significant injury. An additional hand injury also was problematic for the edge rusher. Since 2013, only two more edge rushers have registered more quarterback hits than Vernon. Former Arizona Cardinals’ DC James Bettcher took defensive end Chandler Jones to the next level, as he recorded 17 sacks in a 3-4 defense. If Bettcher implements a similar system in New York, players like Vernon and JPP should benefit significantly. With an injured ankle and hand, Vernon recorded 6.5 sacks and 23 total tackles. These numbers are abysmal for a player taking up $16 million in cap-space (2017) and $17 million in 2018. Luckily for the Giants, there’s an out in 2019 in regard to Vernon’s contract, which would open up $19.5 million in cap-space. 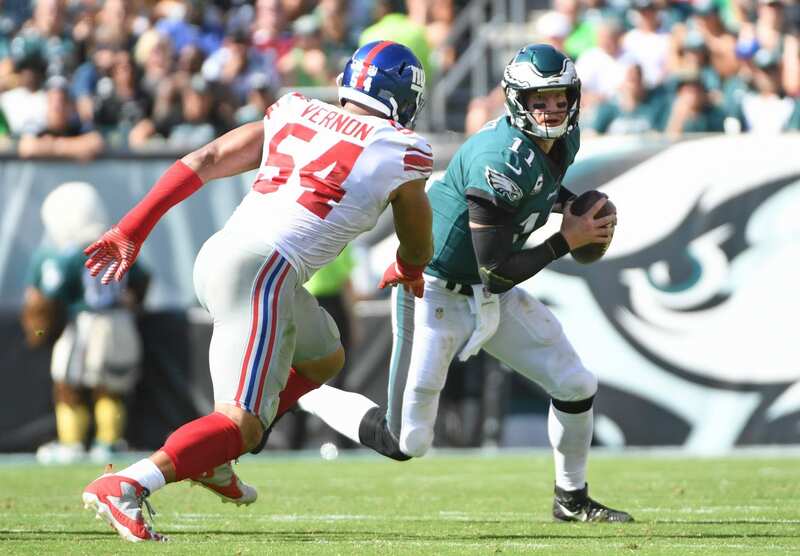 If general manager Dave Gettleman decides to release Vernon and Eli Manning, the Giant could see themselves with upwards of $40 million in open cap. With several big signings this off-season, Big Blue will have significant freedom to sign some high-profile players come 19′.